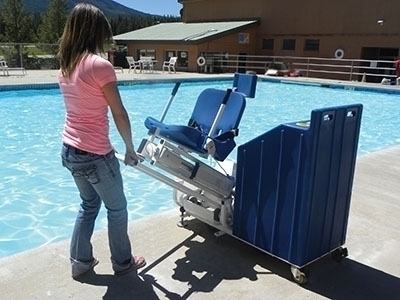 The Patriot Lift is the only completely portable aquatic lift independently verified to meet ADA guidelines. This lift is capable of lifting 375 pounds and remains the highest weight capacity portable lift on the market. 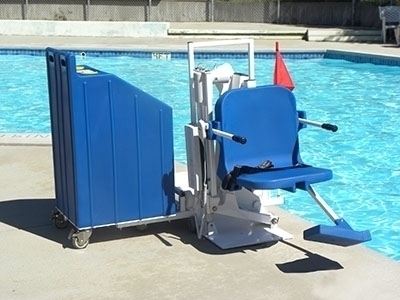 We have recently improved the design on this popular portable lift. Now standard the Patriot will accommodate most deep draft pools. This allows the lift to be used with up to a 12" water draft. When deployed and ready for use, the lift features a specifically designed seat allowing for the easiest lateral transfer from most wheelchairs, giving full freedom of access to the individual. 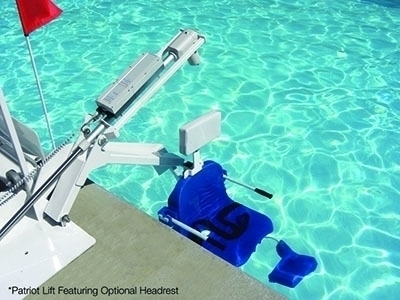 The Patriot Lift is counter-weighted using a sand ballast system. Sand can be sourced locally, saving substantial freight costs. Our FIXING KIT (included) secures the lift in place, allowing for FULL ADA COMPLIANCE. The AT design provides a more compact lift and also gives it additional set back range, giving it the ability to accommodate more gutter variations. Dimensions: 51.63" x 42.5" x 34.88"